This week the commission to investigate the causes of the financial crisis will hold its first public hearing. First up to be accused of causing massive foreclosures, nearly bankrupting our financial system and robbing us all of our retirement savings: Wall Street CEOs. On Wednesday, four top financial executives are scheduled to testify in front of the commission, including Bank of America's recently appointed chief Brian Moynihan, Goldman Sachs' Lloyd Blankfein, JPMorgan's Jamie Dimon and Morgan Stanley's John Mack. Washington commissions and hearings are often yawn-inspiring affairs. But this one, officially called the Financial Crisis Inquiry Commission (FCIC), could trigger some fireworks in part because of the severe damage caused by the financial-industry meltdown. What's more, the commission's chair Phil Angelides, a Democrat and former California state treasurer, has already come out swinging against Wall Street, calling the bonuses financial firms are planning to hand out soon for last year "unjustifiably wrong." 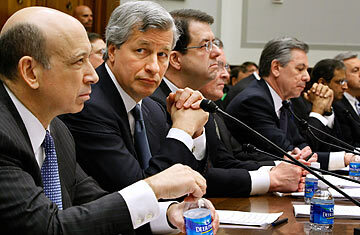 So it's no real surprise that the first ones to be in the hot seat are the bankers themselves. Certainly, the financial crisis blame game has been in full swing for some time now. Ever since Lehman Brothers went belly up, people have been debating the financial crisis. But getting to the bottom of what or who caused the foreclosure of millions of homes and trillions of dollars in losses hasn't been easy. Early on, the majority of people seemed to heap the most blame on barely regulated financial products, like credit-default swaps, which brought down AIG; mortgage brokers and their lax lending standards; and Wall Street bonus checks that rewarded short-term profits over prudent business decisions. Goldman Sachs, too, has come under intense scrutiny since the financial crisis, in part because of its ability to quickly turn around and seemingly profit from the mess. But in the year since the crisis, a number of academics have pretty much refuted nearly every one of those early explanations as being too specific. Some economists have even questioned whether there was a credit crunch. Economic professor René Stulz of Ohio State University, for one, has written papers trying to clear Wall Street pay and credit-default swaps of any blame. Despite recent apologies, Goldman Sachs executives, too, say that they are no more to blame than anyone else in the financial markets. "It has become the immaculate crisis," says Vincent Reinhardt, a senior fellow at the American Enterprise Institute. Even though the bankers are first up, the FCIC won't stop there in heaping the blame. Congress set up the commission early last year with a mandate to investigate 22 possible things, from mortgage fraud to global savings imbalances, that could have either caused the financial crisis or made it worse. Modeled after the 9/11 commission, the FCIC is much larger than any other panel or watchdog created in wake of the financial crisis. The FCIC has 10 members, including six appointed by Democratic lawmakers and four appointed by Republicans. It has a budget to hire 35 staffers and until Dec. 15, 2010, to complete its work. Nonetheless some observers say commissions like the FCIC tend to underwhelm. James Madison University political-science professor Glenn Hastedt, who has written about the 9/11 commission, says politicians shouldn't wait for the FCIC to come up with its conclusions before enacting financial reforms. He says the 9/11 commission did little more than reassure the public that the government was aware of terrorism. "What is the main goal here? If it is to educate and reassure, commissions do that very well," says Hastedt. "But don't look to the FCIC for solutions. Commissions don't do that very well." Still, there are some major differences between the FCIC and the 9/11 commission. The FCIC does not have to deal with a President and an Administration that was in power when the event happened, though the Obama team will probably try to deter any criticism of how the current President responded to the crisis. Another major difference is that most of the major actors in the financial crisis are U.S. citizens, making it easier for the FCIC to subpoena, which Angelides has said he will do, to question the people at the heart of the crisis. Another big difference between the 9/11 commission and the FCIC is the transparency of the process. The 9/11 commission, because it involved national security, held many of its hearings in private and then at the end produced a massive report. The FCIC says it will hold most of its hearings in public, and will quickly release any information it uncovers. Two members of the panel, Keith Hennessey and Byron Georgiou, have their own blogs. Last week, Hennessey, who was a White House economics adviser to President George W. Bush, asked readers what he should be asking bank CEOs. "No one has suggested any limitations to me on how I and other commissioners can interact with the press and public," says Hennessey, who plans to continue to blog while on the commission. "I'm interested in the maximum amount of transparency that is consistent with getting our work done."